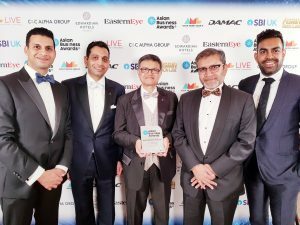 Sigma Pharmaceuticals plc were the proud recipients of the Family Business of the Year 2018 Award presented on the 22 November 2018. The presentation took place at Knebworth Barns, providing a glamorous setting, where finalists across 17 different categories were honoured with business excellence in Hertfordshire. The award was collected jointly by MD Dr Bharat Shah and Rajiv Shah, Sigma’s Sales and Marketing Director. 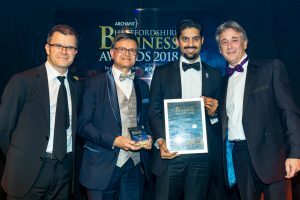 Sigma Pharmaceuticals plc Finance Director Bhavin Shah was the proud recipient of the Leaders in Finance Award 2018, presented on the 21 June 2018 at the Athena, in central Leicester. The Awards ceremony was staged by The British Indian Awards. The announcement of being shortlisted for the prestigious European Business Awards 2016 is a fitting accolade for the company’s performance over the past year.